An ideal gift to say thank you to a special teacher or a perfect Graduation Gift or simply for someone who loves and tea and literature! 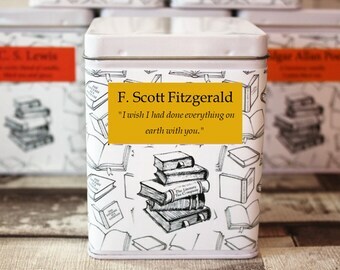 A lovely White Square Tea Caddy wrapped with our distinctive black and white book design, each author carries one of their own quotes. This tin is filled with a cellophane bag of loose leaf tea OR ENGLISH BREAKFAST TEABAGS, each carefully selected blend reflects the nature of the individual author or poet and makes an ideal gift. The square tin has a hinged lid and it's dimensions are: 75mm wide x 75mm deep x 95mm high. 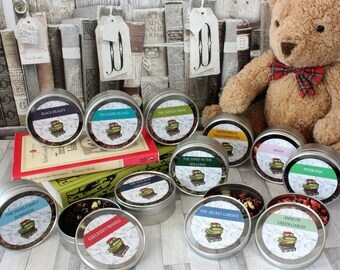 You will be able to make up to 35 cups from each of these LOOSE LEAF teas. 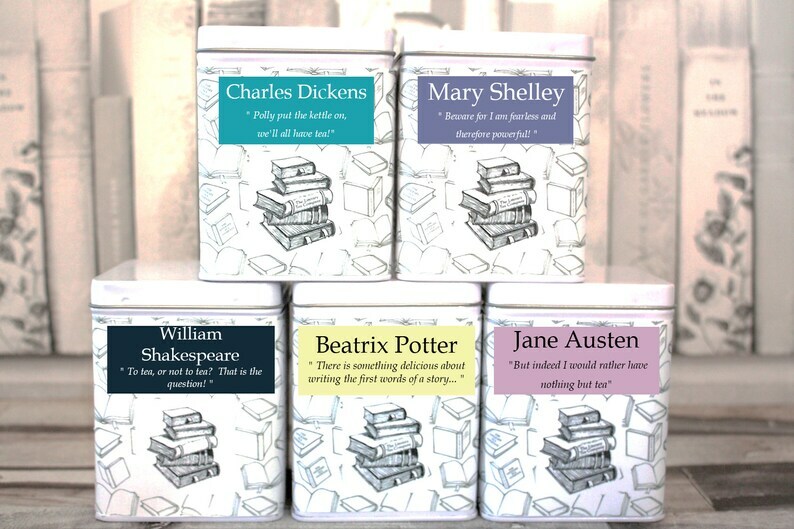 IF YOU WOULD PREFER WE CAN REPLACE THE TEA BLEND CHOSEN BY US FOR EACH LITERARY GREAT WITH 15 PYRAMID TEABAGS FILLED WITH OUR FABULOUS PREMIUM ENGLISH BREAKFAST TEA INSTEAD. A A MILNE - " A proper tea is much nicer than a Very Nearly Tea, which is one you forget about afterwards!" Blenders Note: Our fabulous, bright, zingy, citrusy, fruity, full of flavour orange infusion! This blend is an all fruit tea and makes a wonderful fruity hot infusion or absolutely perfect over ice. It brings a bright ray of sunshine into your cup! Ingredients: Orange peel, orange flowers, apple pieces, rosehips, hibiscus, natural flavour. Naturally caffeine free. Net Weight 80g. ALEXANDRE DUMAS - "All human wisdom is summed up in two words – wait and hope…"
Blenders Notes: Our Lavender Earl Grey is blended with Sri Lankan black tea infused with the ever distinctive bergamot oil. To add a little twist to this wonderfully aromatic tea we have added a sprinkling of lavender flowers to offer a wonderfully perfumed cup of tea. Ingredients: Sri Lankan black tea, lavender de Provence, blue cornflower Petals, bergamot oil. Net Weight 80g. Blenders Notes: This herbal chamomile tea has nothing added or taken away, simply beautiful chamomile flowers for the ideal relaxing drink. 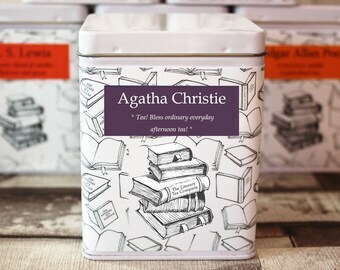 AGATHA CHRISTIE - " Tea! Bless ordinary everyday afternoon tea! " Blenders Note: Darjeeling - Known as the champagne of black teas as its exclusive taste and quality and cannot be replicated anywhere else in the world! Ingredients: Darjeeling 1st Flush Tea. Naturally contains caffeine. Net Weight 80g. ARISTOTLE - " Educating the mind without educating the heart is no education at all. " Ingredients: Peppermint, Fennel and Liquorice. Caffeine Free. Net Weight 70g. ARTHUR CONAN DOYLE - " There is nothing more deceptive than the obvious fact ." Blenders Note: Earl Grey - A tea blend as British as Sir Arthur Conan Doyle himself - A gorgeous large unbroken leaf from Sri Lankan, infused with a strong and distinctive oil of bergamot, then we added a little extra zing from lemon peel and orange flowers too. Ingredients: Sri Lankan Uva black tea, lemon peel, orange flowers, bergamot oil. Naturally contains caffeine. Net Weight 80g. BEATRIX POTTER - " There is something delicious about writing the first words of a story... "
Blenders Note: Strawberry Infusion - This is a wonderful Strawberry all fruit tea. This is a fabulous all fruit infusion, that tastes as good as it smells! A perfect way to drink a cup full of strawberries! Drink either hot or over ice as a fantastic fruit iced tea. Ingredients: Freeze Dried Strawberries, Elderberries, Apple Pieces, Orange Peel, Rosehip, Hibiscus. Natural Flavouring. Naturally caffeine free. Net Weight 80g. BRAM STOKER - " Listen to them, the children of the night. What music they make. " Ingredients: Apple pieces, Hibiscus petals, rosehip peel, Morello cherries, Rose petals, Lemongrass, Elderflower, Orange flowers, natural flavouring. Naturally caffeine free. Net Weight 80g. CHARLES DICKENS - " Polly put the kettle on, we'll all have tea!" Blenders Notes: Dickensian, Connoisseurs Blend - A rich flavoursome blend, a true connoisseurs black tea. Wonderful complex mix of flavours that dance over the tongue. Ideal as accompaniment to the well written words of Charles Dickens! Ingredients: Chinese Yunnan black tea, Chinese Mao Feng black tea, Indian 1st Flush Darjeeling. Naturally contains caffeine. Net Weight 80g. CHARLOTTE BRONTE -" I would always rather be happy than dignified. " Ingredients: Chinese jasmine white tea. Naturally contains caffeine. Net Weight 40g. Blenders Notes:If you like a little something with a big kick then this could be just right for you! With the growing trend for Chilli in the UK we thought why leave Tea out? This is a glorious blend of the finest mint leaves with real chilli mixed in. It’s a simple mix but be warned the longer you leave this the more powerful the chilli kick – how far dare you push it! Ingredients: Spearmint, red peppercorns. Net Weight 50g. Blenders Notes:This is a beautiful tea, Rose Earl Grey, blended with Sri Lankan black tea infused with distinctive bergamot oil, we have then added a sprinkling of rose buds and petals to offer a delicately perfumed cup of tea. Ingredients: Sri Lankan black tea, rose buds and petals, bergamot oil. Net Weight 70g. Blenders Notes: A fabulous blend of silky chocolate with the aromatic touch of rose petals. A delicious black tea, that has a subtle touch of perfumed rose, just think chocolate covered Turkish Delight! Ingredients: Sri Lankan and Chinese Keemun black teas, rose petals, vanilla pieces, chocolate and vanilla flavouring, cocoa shells. Naturally contains caffeine. Net Weight 70g. EDGAR ALLAN POE - " All that we see or seem is but a dream within a dream." Ingredients: Sri Lankan Black Tea, Vanilla Pieces, Calendula Petals and natural flavour. Naturally contains caffeine. Net Weight 80g. EMILY BRONTE - " Whatever our souls are made of his and mine are the same." Blenders Notes: Peach Blossom - One of our favourites, this absolutely fabulous infusion oozes with peach and blossoms to offer your taste buds one of the best fruit experiences you will ever have had! You cannot say no to this luxurious fruit tisane. Ingredients: Apple pieces, orange pieces, rosehip pieces, hibiscus, jasmine flowers, orange flowers, natural flavour. Naturally caffeine free. Net Weight 80g. FYODOR DOSTOEVSKY - " I say let the world go to hell, but I should always have my tea." Blenders Notes: Russian Caravan - A very aromatic and flavoursome smoked tea, blended from Oolong, Chinese Keemun and Lapsang Souchong. A very distinctive and morish black tea. Ingredients: Oolong, China Keemun and Lapsang Souchong. Naturally contains caffeine. Net Weight 80g. F. SCOTT FITZGERALD - "I wish I had done everything on earth with you." Blenders Notes: We have taken a high quality black tea then blended it with wonderful Passion Fruit and Mango, a truly delicious tea. A wonderful fruity black tea with a truly tropical zing! Ingredients: Sri Lankan black tea, mango pieces, passion fruit pieces, orange peel, rosehip, hibiscus, natural flavour. Naturally contains caffeine. Net Weight 80g. Blenders Notes:A truly aromatic warming infusion of sweet liquorice, blended with fennel, ginger, lemon balm and cinnamon. Not only will it warm you as it gently works its way down but should also be a wonderful soother for the tummy too. Liquorice, lemon balm, ginger, fennel and cinnamon. Naturally caffeine free. Net Weight 60g. Ingredients: Indian Assam, Sri Lankan black tea, Indian 1st flush Darjeeling, Kentish Hops, caramel pieces, cocoa pieces, natural flavouring. Naturally contains caffeine. Net Weight 70g. H G WELLS - " When I see an adult on a bicycle I do not despair for the human race! " Blenders Notes: Cherry and Almond Tea - A really well balanced full of flavour tea, blended with a fabulous Ceylon black tea which is delicate in flavour , with just the right amount of almond pieces perfectly matched with slices of freeze dried cherries. A lovely fruity blend with a hint of almonds. Ingredients: Sri Lankan black tea, freeze dried sliced cherries, ALMOND pieces, cranberry pieces, raspberry pieces, strawberry pieces, red cornflowers and natural cherry flavour. Naturally contains caffeine. Net Weight 80g. Blenders Notes: A truly luxurious blend of black tea, real cocoa and zesty orange, two flavours that work so well together! You still know you are drinking tea but it has subtle notes of cocoa and juicy orange. Ingredients: Sri Lankan black tea, vanilla pieces, chocolate and vanilla flavouring, cocoa shells, orange peel, orange flowers, apple pieces, rosehips, hibiscus, natural orange flavour. Naturally contains caffeine. Blenders Notes: This great black tea leaf is an extremely high quality large leaf variety from the Qimen Provence in China. It has fabulous, slightly light perfume and full bodied with a mellow, sweet taste. It is known as the Burgundy of black teas - like a glass of fine wine but in a cup! Ingredients: Chinese Keemun Mao Feng black tea. Naturally contains caffeine. Net Weight 70g. J M BARRIE - " Would you like an adventure now or first shall we have tea?! " Blenders Notes: Rich Chocolate - A truly luxurious blend of black tea and real cocoa. Fill up a mug, wrap your hands around it and breathe in the gorgeous aroma of chocolate and vanilla. Even better itís a cup full of choccie without the guilt of any calories! Ingredients: Sri Lankan black tea, vanilla pieces, Chocolate and vanilla flavouring, cocoa shells. Naturally contains caffeine. Net Weight 80g. JAMES JOYCE - " Love Loves to Love Love!" Blenders Notes: Cherry & Rhubarb Green Tea - A lovely fruity green tea, a wonderful mix of Japanese green tea and delicious juicy flavours of rhubarb and cherries. This makes a beautiful refreshing alternative for drinking at breakfast or for a little afternoon lift. Ingredients: Japanese Sencha green tea, hibiscus, rose petals, rhubarb pieces and natural flavours. Naturally contains caffeine. Net Weight 80g. JANE AUSTEN -"But indeed I would rather have nothing but tea"
Blenders Notes: Rose Black Tea - A reflection of what must have been Jane's own delicate but bright personality. Ingredients: Chinese Black Tea (85%), Rose Buds and Rose Petals. Naturally contains caffeine. Net Weight 70g. Blenders Notes: A herbal tea to help you relax and unwind. A truly wonderful mix of chamomile, lavender and passion flower. Drink before bedtime to ease you into a peaceful sleep. Ingredients: Chamomile, rose petals, lavender flowers, passion flowers. Naturally caffeine free. JULES VERNE – "Anything you can imagine you can make real." Blenders Notes: We have blended Chinese smoked black tea with a high quality Ceylon, then added almond pieces to give a strong, well rounded, full of nutty notes tea. One of our team cannot get enough marzipan in his life and since tasting this tea has drunk nothing else! Ingredients: Sri Lankan black tea, almond pieces, smoked Chinese black tea, almond flavouring. Naturally contains caffeine. ALLERGEN WARNING: CONTAINS NUTS. Net Weight 80g. LEO TOLSTOY - “Tea unleashes the potential which slumbers in the depth of my soul." Blenders Notes: Oolong and Mint Tea - The light freshness of the mint combined with the heady scents of Oolong makes for a wonderful refreshing tea. I have also found that it really helps with digestion too. Ingredients: Ti Guan Yin Oolong, Peppermint & Spearmint. Naturally contains caffeine. Net Weight 70g. LEWIS CARROLL - " The hurrier I go, the behinder I get! " Blenders Notes: Forest Fruit Infusion - A riot of fruity flavours in each and every cup. A wonderful mix of real berries, flowers and fruits, this really is a fantastic fresh tasting infusion that could so easily be a great big bowl of beautiful berries. Ingredients: Hibiscus, rosehip, orange peel, apple pieces, elderberries, flavour, blackberry leaves, sea buckthorn berries. Naturally caffeine free. Net Weight 80g. Blenders Notes: Kashmiri Green Chai - We have chosen an exotic tea to reflect the exotic nature of Lord Byron! This is such a beautiful tea, the goodness of green tea blended with Asian delights to give you an uplifting, gently spiced flavour with truly refreshing qualities. Ingredients: Chinese Imperial Pinhead green tea, cardamom, safflower, jasmine blossoms, calendula petals, sunflower petals and natural flavours. Naturally contains caffeine. Net Weight 80g. LOUISA MAY ALCOTT – "Good books like good friends, are few and chosen; the more select the more enjoyable." Blenders Notes: This is a delightful light blend of green tea with a citrus lemon touch and the gentle aromatic perfume of rose petals. A really refreshing tea with a little citrus rose zing! Ingredients: Chinese green tea, lemon grass, lemon verbena, lemon pieces, rose petals, rose buds, natural lemon flavour. Naturally contains caffeine. Net Weight 70g. OVID – "Fortune and Love Favour the Brave"
Blenders Notes: For those of you who may not know, Assam is pretty much the strongest large leaf black tea that you can buy. Our Assam is of supreme quality, it is both powerful and malty and gives a strong, distinctive taste. A perfect tea if you are looking for strength in character and colour, it will easily give you that morning boost! Ingredients: Assam Indian Black Tea. Naturally contains caffeine. Net Weight 80g. MARK TWAIN -" The two most important days of your life are the day you were born, and the day you found out why." Blenders Note: Caramel Dream Rooibos - A wonderful herbal tea blend of South African Rooibos and sweet caramel. Like having a dessert in a cup, it really is very morish. Ingredients: South African Rooibos, Calendula petals, natural flavour. Naturally caffeine free. Net Weight 80g. MARY SHELLEY - Beware for I am fearless and therefore powerful! " Blenders Note: Sweet Lavender - Sri Lankan large leaf black tea blended with lavender flowers to calm your senses, then a little sweetness of vanilla. The aroma of the lavender is so silky and smooth with the just the slightest hints of fudge notes to add that little bit of extra luxury. Ingredients: Sri Lankan black tea, vanilla pieces, Kentish lavender flowers, flavouring. Naturally contains caffeine. Net Weight 80g. PLATO – "Courage is knowing what not to fear." Blenders Notes: This is a truly distinctive rich Chinese black tea, made in the traditional way of slowly smoking the leaves over pine wood. The leaves are of a high quality, unbroken variety; they will brew a good strength black tea with the obvious smoked taste and aroma. Ingredients: Chinese Lapsang Souchong. Naturally contains caffeine. Net Weight 80g. ROBERT LOUIS STEVENSON – "You can give without loving, but you cannot love without giving." Ingredients: Chinese green tea, lemon grass, lemon verbena, flavour, lemon pieces. Naturally contains caffeine. Net Weight 70g. RUDYARD KIPLING – "Never look backwards or you will fall down the stairs!" Ingredients: Apple pieces, pineapple, mango, coconut, natural flavour, orange flowers, hibiscus, rosehip. Naturally caffeine free. Net Weight 80g. THOMAS HARDY – "Time changes everything except for something within us which is always surprised by change." Blenders Notes: A relaxing, fragrant blend with all the goodness of a wonderful Yunnan Provence green tea leaf. The leaves are dried and laid amongst glorious Jasmine Flowers, over time the heavenly scent is infused into these leaves. Jasmine has a wonderful relaxing effect. Ingredients: Chinese jasmine green tea. Naturally contains caffeine. Net Weight 80g. SOCRATES – "To know, is to know that you know nothing." Blenders Notes: A delightful light refreshing super green tea. This has a clean, light fragrance of a fresh tea. Apart from the fact that this is a great green tea it is very high in polyphenols, catechins and antioxidants which has been suggested through scientific research that these elements have powerful health benefits. Ingredients: Japanese green tea. Naturally contains caffeine. Net Weight 80g. SOPHOCLES – "If we always helped one another, no one would need good luck." TOLKIEN - " Not all those who wander are lost." Blenders Note: Green Seaside - We used wonderful high grade Sencha and enhanced it using seabuck thorn to add a gentle saltyness, mixed in bright spearmint, a dash of lemon verbena and then sprinkled blue cornflowers, the result a bright, refreshing blend which has proved to be a success time and time again. Ingredients: Japaneses Sencha, Sea buckthorn, Lemon Verbena, Spearmint and Cornflowers Naturally contains caffeine. Net Weight 70g. Blenders Notes: Lemon & Ginger Infusion - Lemon and Ginger- Warm spicy ginger blended with a wonderful zesty lemon kick, a fantastic drink for after dinner. As a gentle digestive soother or as a quick pick me up at breakfast; whenever you fancy its sure to tickle your taste buds! Ingredients: Lemongrass, Lemon Peel, Lemon Balm, Ginger. Naturally caffeine free. VICTOR HUGO – "Even the darkest night will end, and the sun will rise." Ingredients: Premium Indian black tea, Dried apple, cinnamon pieces, freeze dried apple, blackberry leaves, safflower petals and natural flavour. Naturally contains caffeine. Net Weight 70g. VIRGIL – "Love conquers all things; let us too surrender to love." Blenders Notes: Orange Pekoe whole leaf Ceylon black tea, from the Dimbula region in Sri Lanka. It is a high quality tea that gives a golden cup tea with a delicate and mellow flavour. Ingredients: Sri Lankan Full leaf orange pekoe black tea. Naturally contains caffeine. Net Weight 70g. 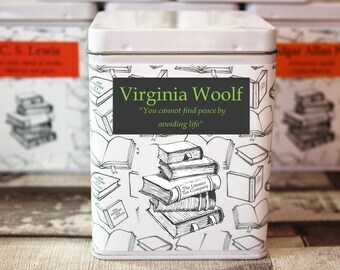 VIRGINIA WOLF – "You cannot find peace by avoiding life." Ingredients: Chinese Green Tea, lemon peel & orange blossom, natural flavour. Naturally contains caffeine. WILLIAM SHAKESPEARE -" To tea, or not to tea? " Blenders Note: Premium English Breakfast Tea - Our breakfast tea is of a premium quality, we believe we have the flavours perfectly balanced and are excellent. We have chosen to use several different black tea leaves from Sri Lanka, India, Kenya and Rwanda which we believe offers a full of flavour, rich malty blend. Ingredients: Indian Assam, Sri Lankan Dimbula, Kenyan Milima & Rwandan Black Teas. Naturally contains caffeine. Net Weight 80g. WILLIAM WORDSWORTH - " The little unremembered acts of kindness and love are the best parts of a person's life." Blenders Notes: Quiet Time Rooibos - This is a beautiful calming tea, ideal when seeking a quiet moment of calm. Excellent warming vanilla flavoured South African Rooibos blended with all natural aromatic chamomile flowers and lavender. Simply excellent, warming, sweet and relaxing. Ingredients: South African Rooibos, Egyptian chamomile and lavender de Provence, natural vanilla flavouring. Naturally caffeine free. Net Weight 60g. Simply lovely idea and amazing tea! All trade enquiries are welcome as we supply multiple customers throughout the world! Please bear in mind that due to all our products being handmade and the fact that we strive to offer the best value to our direct customers we cannot offer huge discounts for trade! However please let us know if you are interested and we will strive to offer wholesale discounts on a limited range of our products. We also offer a bespoke label design service to compliment your theme for subscription box companies, gift boxes/hampers, museums, stately homes and tourist attractions. Please be aware we do not offer wholesale prices on the Tea Infusers with charms. Contact us to see if we can help, please outline clearly your request, we will try to say yes! We do not offer a gift wrap service, however all our orders are wrapped in white tissue paper and sealed with our company label before being boxed. If it is a gift make sure you complete the Etsy gift message, we will pop it inside the box with your order. All our teas and infusions will last for at least 12 months from the date of purchase providing it is stored in an airtight container, away from direct light and strong odours. We send all our orders tracked. Within the UK parcels are sent on a Tracked 48 hour delivery with Royal Mail. All overseas parcels are sent tracked via UK Royal Mail post, they are then handed over to the recipients relevant country postal service, there will always be a tracking number provided so that you can watch the progress of your package. Large orders may be eligible for Courier shipment, we will advise you of this prior to shipment. Could you arrange a fast delivery? We will look at every request individually and always endeavour to help where we possibly can. Please message us to ask, if this is something you would like! I missed my delivery and I failed to collect my parcel, what happens now? It is the responsibility of the purchaser (customer) to take receipt of the parcel. We cannot be held responsible for failure to do so, and unfortunately, if it is a purchase of tea, in any format, we are unable to offer a refund as it is a perishable product. All our items are NOT licensed products. Do any of your teas contain allergens? Although we are very careful with which ingredients are used and attempt to limit cross contamination we DO NOT work within a fully sterile environment; for this reason we cannot say without doubt that any of our products may or may not not contain traces of allergens, this is purely due to the differing ingredients we purchase and the trace warnings that they carry. Due to manufacturing processes this tea may contain traces of: Cereals containing gluten, tree nuts, peanuts, sesame seeds, milk, soya, mustard and sulphur dioxide (>10mg/kg). If you have specific queries with regards to any of our tea blends then please send us a message.